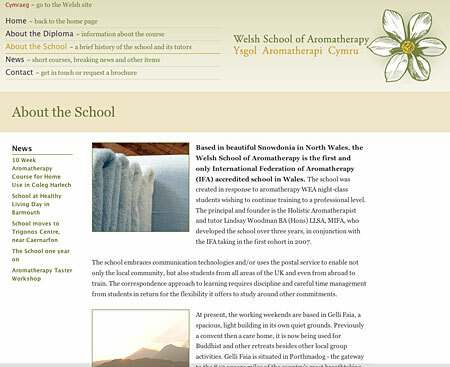 We’re always pleased when jobs come along that require us to stretch our knowledge and learn new skills, so when the Welsh School of Aromatherapy rang to ask if we would be interested in building a bilingual site (Welsh and English) for them, we were only too pleased to help. We’ve done lots of bilingual websites in the past of course, but this was the first time we’d tried to apply our skills using WordPress as a CMS, in two languages and with direct translation from one page to its equivalent in the other language. The plugin we opted for in the end was xLanguage by the extremely helpful HelloSam which, whilst our php skills weren’t really prepared for such a steep learning curve (and with several very supportive pointers in the right direction from Sam), did eventually do exactly what we wanted it to do. In the process we also ended up creating a welsh version of Mike Cherim’s excellent Secure Contact Form. There’s a few bits in the welsh language file which still need translating, but once we find someone to do those, we’ll send Mike the finished version to add to the download. In the meantime if anyone wants the incomplete version (it’s just missing a few error messages) drop us a line. 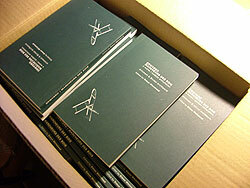 You can see the file in action on the Aromatherapy Wales site. Thankfully, the work wasn’t all coding and we did find time to have fun with some of the School’s ideas for a logo. The first go at this was a graphic version of a narcissus which, whilst it worked fine, didn’t really hit the spot. But salvation came in the form of David Attenborough, as usual, whose beautiful show Amazing Rare Things at the Queen’s Gallery included an illustration of a poet’s narcissus, apparently the first narcissus to arrive on British shores way back when. We’re also planning to make the theme available along with some instructions as to how to set up xlanguage to work in Welsh and English (if only to remind us how to do it). More on that story later.